Good morning! The sun has finally peeked out from all the rain clouds! That means I can head out for my first little walk soon. So, what’s 20 years you ask? Well, I graduated from High School in 1993, so that means my 20 year class reunion is this summer. I have yet to attend any class reunions, 5 year – no way, 10 year – eh, 15 year – almost went since I was in town for my stepdad’s funeral. This morning I log onto Facebook and see the invite. I told myself I was going to go this year. So, I booked the hotel room! I have to tell hubby yet tonight since he’ll need that Friday off work to drive to Minnesota. What’s different now? Well, I’m married for 15 years, I have two beautiful daughters, a nice home, stability and better health. I’m not the same person I was in high school, yet I have a feeling I’ll go there feeling less than confident. It’s something I can work on for the next two months, confidence. My hometown is small, like 2000 people small. It does have a hotel now and when I checked online all the rooms were booked. Ugg…I checked around in neighboring towns, which are all 29-30 minutes away. Then I thought, I’ll just call and see. Thankfully they have some rooms available. I got the suite so we’ll have a fridge and microwave. Being there from a Friday afternoon – Sunday morning is going to require some food from home. I can not possibly eat out for that many meals and feel good physically. The hotel has a pool and hot tub, and the fitness room is iffy. Someone online posted about not being able to get the key or something. I figure I know the town well enough to get a run in each morning and have it amount to a good workout. Oh, the weekend of the reunion is also the weekend of Riverside Days. I guess it’s some type of weekend-long party in the Riverside Park. I don’t really remember having them when I lived there so it must be something new. A lot has really changed in my hometown. I haven’t been there since 2008 when my stepdad died. I was in town that weekend of the reunion but decided to head home before it started since I’d had enough emotional drainage the entire week I was there. Alright, enough talk about that. Moving on…..
My morning workout was a 20 minute program on the treadmill, ab work and then a 12 minute run on the treadmill. It’s going to be in the 80’s today and I’m going to head out soon for a mile walk. Then this afternoon when L is at piano lessons, C and I will walk for 20-30 minutes around town while we wait. That’ll be enough activity for me today. Hubby had his first day of work yesterday. It went okay. He’s not a real talkative type guy, but he said it was just okay. Today he is working on another job they have, but still about the same distance from home. His dad is still in the hospital and if he gets out today hubby will pick him up after work. I think that’s my novel for this morning! Enjoy the great weather! Good Monday morning! Things are strange around here. Hubby is at work and I’m alone. I haven’t been ‘alone’ in a few months. I’m not sure how I feel about it. I’m happy to have hubby working and making money, but I’ll miss having him around. This weekend when I was in Madison checking out the Farmer’s Market, I can across fried cheese. I tried a sample of the pizza flavored cheese. It was freakin’ awesome! So I decided to try to recreate it a bit at home. 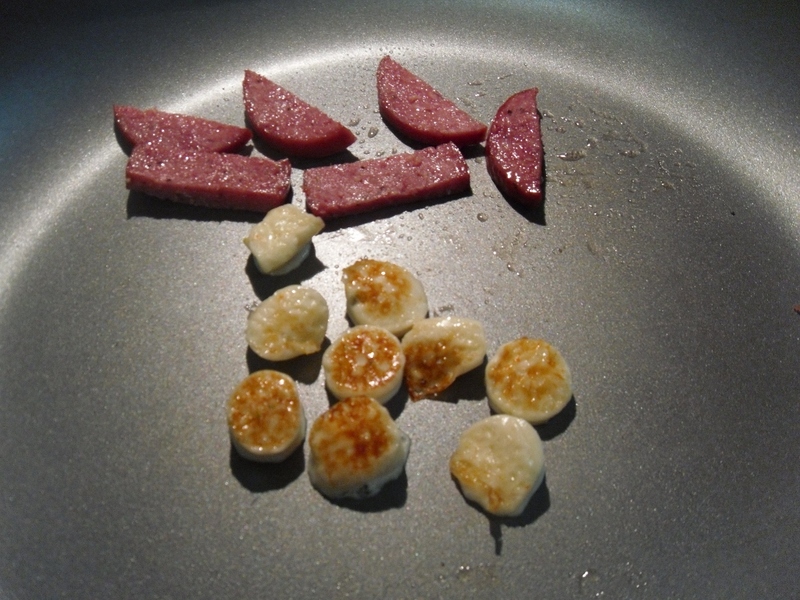 I took a Weight Watchers Jalepeno string cheese, cut it up and fried it in a pan (dry pan). This is what it looked like. The verdict? It was good when it was still warm, once it cooled off it was okay. I’ll do it again though. Yesterday I also worked in the garden a bit. I raked out garden #2 and L helped me pull some of the weeds. The surprising thing was I did NOT even ask for help, she just volunteered! That is major progress in our family. I think it helped that C was over at a friend’s house for a playdate and L was feeling a bit lonely. I’ll use that to my advantage! My morning workout was 10 minutes on the elliptical and then Level 3 of Ripped in 30 with Jillian. I’m also headed to Zumba in a little bit. Home scale said 148.8#. I’m hoping that holds steady for Wednesday’s weigh-in. Yesterday was a great day! I got up at 4:30am and did 32 minutes on the treadmill along with some ab exercises. Brandy picked me up at 6:45am and we headed down to Vicki’s house. 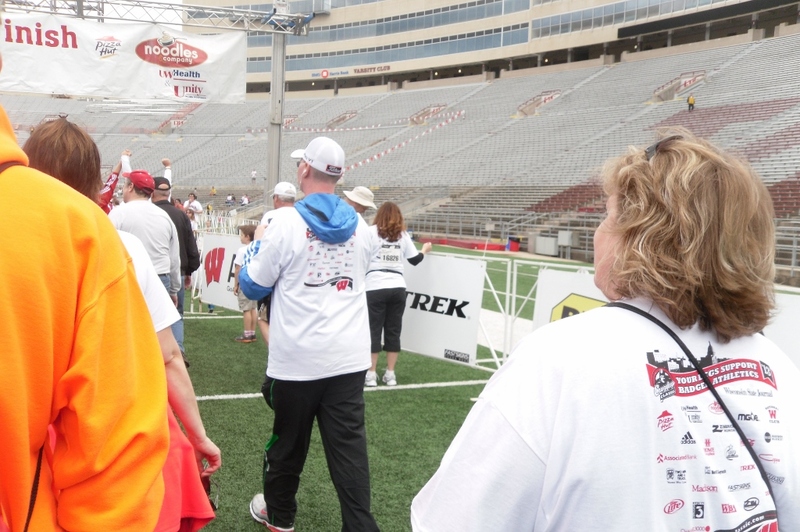 We were all driving down to Madison together to walk in the Crazylegs race. 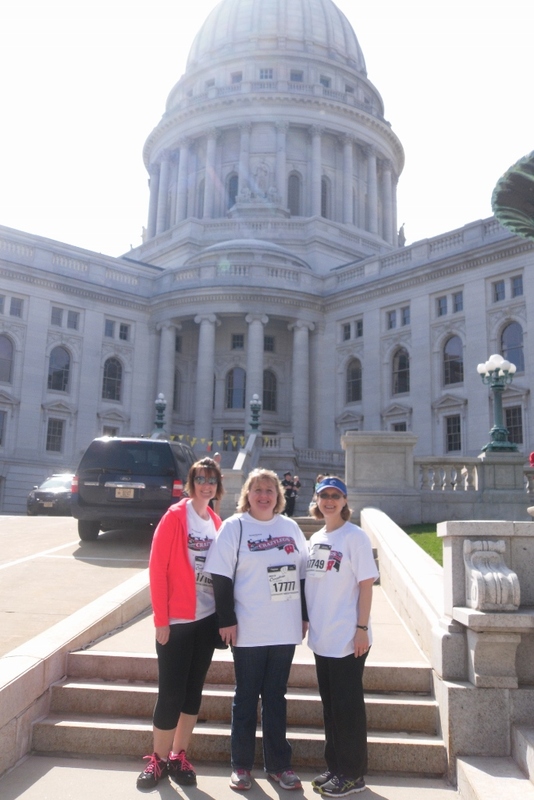 We got to Madison pretty early and walked around the square to check out the Farmer’s Market and the State Capitol building. 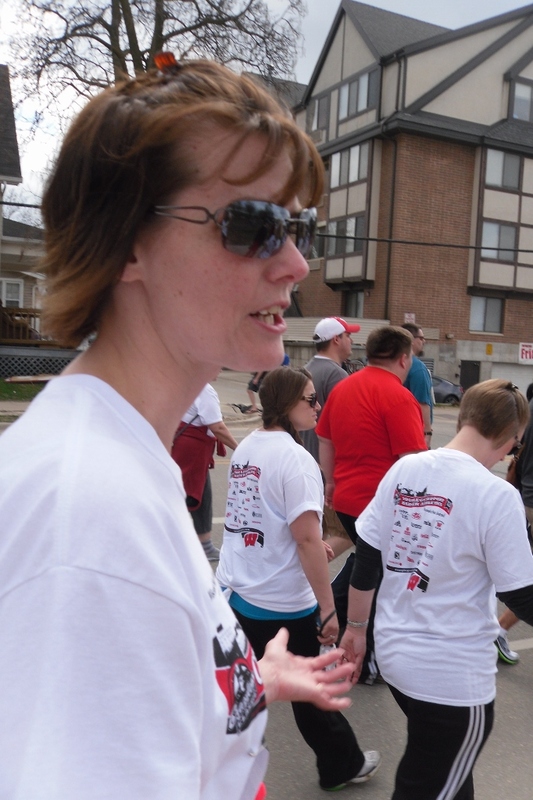 The walk started at 10am, but by the time we actually crossed the starting line it was 10:15am. 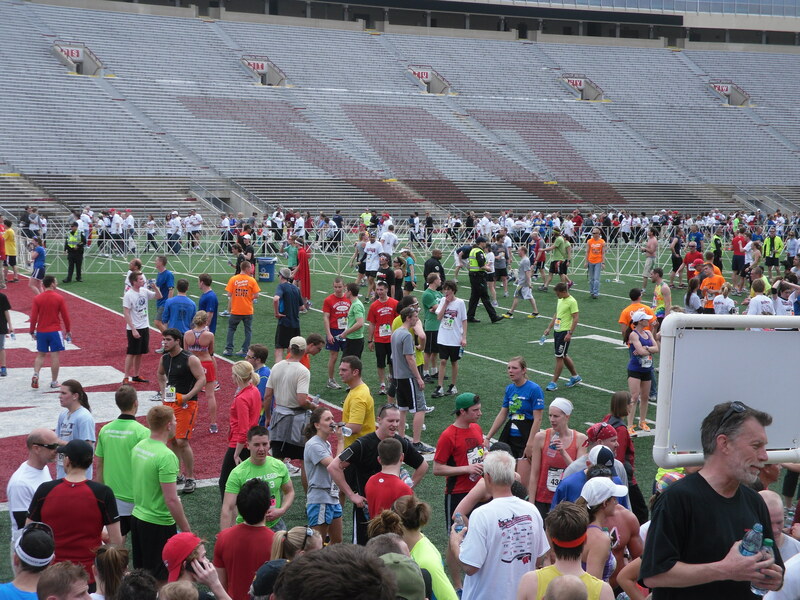 It took us just over 30 minutes to walk to Camp Randall Stadium. It was pretty awesome to be there with so many people! The music was pretty decent too, lots of 80’s music. We sat around for a bit to people watch. At that point we had been walking around for almost 3 hours! I was thankful to sit for a bit. For lunch we all went to Applebee’s. We were going to try to eat some where on the square, but most of them only serve Brunch on Saturdays. I got home around 2pm and we walked over to my friend Tami’s house. She was having a garage sale so I used it as a good excuse to get the girls outside and walking! hehe While we were there we set up a playdate for this morning for the 8 year old girls. Yesterday afternoon my MIL called to say my FIL was going back down to Madison to the hospital. I hope to hear more news about how he is doing today. I had bad dreams about the outcome and I only hope I am wrong. This morning is a day off for me. I’ve earned 30 Activity Points in the past 3 days and I just want to ‘be’ today. Yeah, I’ll walk around a little bit and maybe do some gardening later on when it gets a bit warmer, but no hard-core cardio for me today. The scale was at 148.4# which is fantastic. I weigh-in on Wednesday and I’d like it to be a good one for May. I’ll leave you with some photos from yesterday! Good afternoon! The sun is out today and it’s beautiful! I’m headed outside to enjoy it. My morning workout was 20 minutes on the elliptical and then Workout 8 with Jillian. Not too hard, but I can not do one move with the weights. Oh well, I adapted and did it without them. Instead of Zumba this morning hubby and I went for a 40 minute walk and then did some shopping for the weekend. L is having one friend stay over tonight. I had to get a few snacky food items that can double up for lunches next week. I also went to get Wreck-It Ralph and Mr. Popper’s Penguins. C just finished reading Mr. Popper this week in school and L read it 2 years ago. We’ve already seen this movie, but I thought it would be more fun for C since she’s read the book. The bonus was when we went to checkout the man said the first movie was FREE and the other was 1/2 price! 53 cents later and we had 2 movies. Sweet deal! After lunch today I got outside and tackled my flower beds. They were full of dead plants from last fall. In about an hour I got them all cleaned up and ready for the new flowers to emerge. Right now the crocus, tulips and hyacinths are out, but not flowered. Next on my list is to get my vegetable gardens planned out. When supper was done and we had the dishes done, hubby and I went for a walk around the loop. I definitely got in my activity today. I’ve decided to treat tomorrow morning like a weekday. I’m getting up at 4:30am and doing a short run on the treadmill. I just don’t want to feel like 2 miles wasn’t ‘enough’ of a workout for me. I’m thinking Sunday may turn into a day of rest. We’ll see. That’s it from me. I’m hoping to continue to enjoy this beautiful weather! I don’t have much to report these days. I’m still working out, weighing myself when I want to, eating pretty well. I did attend a new class yesterday called R.I.P.P.E.D. It is taught by the Zumba instructor but it definately is NOT Zumba. We did weights, plyometrics, abs, intervals, etc. It was a fun time and the 60 minutes flew by. I worked Weight Watchers yesterday. The new leader is coming into his own and for that I’m grateful. We had about 24 people stay for the meeting and I didn’t remember to check how many people weighed in. My coworker Cheryl brought me some clothes yesterday. I was just thinking I’d like a new zippered sweatshirt, well, she brought me 4 of them! I think we have an intuition with each other because when I emailed her about the girls having head lice she said she was just thinking about that for some reason. Strange coinsidence. I work WW tonight and I’m happy to be back after staying home last week. I miss seeing everyone that attends the meetings. No other news to report. I’m hoping to get out into the sunshine at some point today. The next week looks awesome for weather. Good morning! I had a really nice, low-key weekend. We are head lice free! Thank goodness. My workout this morning was 15 minutes on the elliptical and then I couldn’t decide what to do. I’m tired of Jillian’s workout 5 & 6, sooooo I decided to pop in workout 7! Eak! Tough, but much more exciting than 6. I’m glad I did it but my arms were trembling and twitching like crazy. My only hope is that Zumba +Toning this morning won’t render my arms useless! 😛 The home scale is 148.4# which is great considering I had more points yesterday. I decided to get in my ‘healthy’ fats and hit up the cashews a bit. 😛 Yummy! Sadly, they are high in points. At 1pm today I meet with the library director, my boss, Shannon. I’m excited to get the paperwork done and find out when I’ll be able to work. The shifts are 9-1, 1-5, 5-close, Saturdays are 9-2. Anyway, she asked that I come in with requested time off so that she can get me on the schedule AND work around mine. I love the flexibility. Hubby got a call last night from his new boss, Jim. He won’t need hubby to start until next week. He’s going to mail him the paperwork to fill out though. I’m excited for hubby to have a job again. His new boss sounds like a great guy and it seems he runs his business very professionally. Always a plus. I’m unsure of how my week is going to pan out with starting to work at the library, but here’s what I have tentatively planned. Friday – Zumba, sleepover at our house if I don’t work. It also looks that by the weekend it will be in the upper 60’s and sunny! I’m so looking forward to that. Enjoy your day! I got in my workout at home. I did Workout 5 of Jillian’s 90 Day Revolution and then I went to Zumba for an hour. My weight was 148.8#. When I got home I decided the girls and I needed to go around the neighborhood and sell some fundraiser items. We only hit up 3 homes of people we know well, the 4th person wasn’t home. Hubby was gone for a walk and the sun just motivated me to get outdoors, even though my hands were freezing. A lice update – yesterday afternoon I rechecked L’s hair, nothing! I rechecked C’s hair and found a few eggs and 1 live one! Only 1! To me that means we are almost done with this thing! I shampoo C’s hair again on Monday and after that I’m going to just keep checking periodically. I’m thankful this time around the head lice isn’t as bad.